2019 Poster – Call For Designs! Are we a massively creative community? Hell, yes! Do we have loads of great artists, illustrators and designers in our midst? Definitely! So, for our 2019 event, and in the spirit of inclusion, participation and all those good things we hold in high regard, we’re mixing things up a little, by putting out this invitation to you, our community, to design our 2019 event poster. The design selected as our official 2019 event poster will go on to be printed (5 000 copies) which will be distributed and erected throughout South Africa at a wide range of social spaces that the AfrikaBurn community frequents, and will also be distributed for free at our year-round events such as Decompression, Streetopia (and also at a wide range of independent fundraiser events held in the run-up period to our 2019 event). The design will also be made available as a hi-res PDF download here on our site. This will ensure great exposure for the creator of the design – and they will receive two tickets to our 2019 event in appreciation for their time and art. What About The Designs That Are Not Selected As The 2019 Poster? We welcome as many design and illustrations as possible, as these will be used to form a portion of the artwork used in our 2019 Survival Guide and WTF Guide – and, depending on suitability for format/s – elements of them may also be used in a range of applications such as portfolio t-shirt designs, stickers and so on. Read the brief below and get inspired: we’re really looking forward to seeing what you come up with! 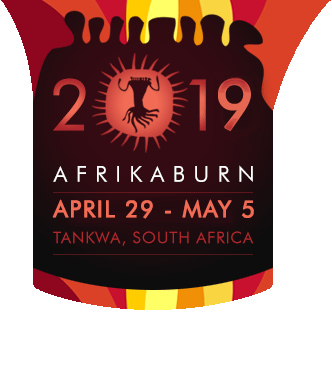 You’re invited to submit your interpretation of the AfrikaBurn 2019 event theme, as a poster design. This brief is being shared with other designers and illustrators, who are all able to submit one or more poster design. The selected design will go on to become the official event poster for the 2019 event and will be printed in a limited run of 5 000. The choice of AfrikaBurn 2019’s theme has been confirmed as ‘Ephemeropolis’. In essence, an ephemeropolis is a temporary city, drawing from the Greek ‘ephemera’ (temporary) and ‘-polis’ (city). In the context of AfrikaBurn, this applies to the unique nature of Tankwa Town, the city of creativity that comes together once a year for a week, and is then dismantled, disappearing until a year later. It’s a city of colour, culture and creative projects that brings together many different structures, skills and disciplines. For the full rationale of the theme, see the Theme 2019 rationale right here. This year, our communications team is inviting a range of graphic artists and illustrators to create their version of what the 2019 poster could look like. Font is not specified, and is open to your interpretation. However, the choice of font must be legible, it’s advised to make use of typography that is sufficiently weighted so that it is clear what the poster is for, and where & when the event is. For the past 12 years, a general guideline of using Tankwa-related tones of brown, ochre, yellow and red has resulted in many of the event posters featuring these, and thus in some respects having a similarity in palette. This can be continued, though is not a critical inclusion in the creation of the poster. Hi-res examples of previous posters can be seen on our Archive page which features all past posters and event guides etc. Similarly, the use of texture and reference to artworks, mutant vehicles, theme camps and other elements of the event has featured in many posters over the years. The same applies to silhouettes of the Cederberg mountains. Again, you’re welcome to consider using these but they are not a critical element in terms of determining which design may go on to be printed as the official 2019 poster. Graphic device: the San Clan emblem can be included – and you’re able to use the version below, or click to download the .psd file. Interpretations of the Clan are also welcome. Please note that any poster design that deviates from these specs cannot be considered for final selection. – the content and / or font of the poster may be used to inform the creation of social media banners and page headers, as well as ticket artwork for the 2019 event. Need more info? Shoot a mail to [email protected] and our team will help.